They make it look so easy - Stop staring and start sewing! When I knew I was going to start putting my designs into actual patterns I thought it would be so simple. I mean really, how hard can it be? Look at a pattern... simple pictures, easy instructions, no problema. Well it turns out there's a good chance that the easier your pattern is, the more work went into making it look that way and I have developed a whole new respect for those folks who make clear and concise patterns. My pdf patterns have been a good starting point but it's hard to control things because the photographs can get muddy if your printer is less than amazing so I never know what quality a buyer will end up with at their home and I really want buyers to end up with a great product. My newest pdf patterns are all computer made so they look so much better than my first pdf pattern and take a lot less pictures since I can express a multitude of steps with one picture. This picture clearly shows the back pleat, side seams, gathering stitches and it's shade on the right side of the fabric. It's a little lop-sided but I know how to fix that now. 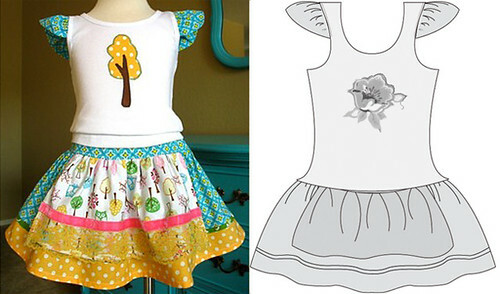 I was sure I wanted my patterns to have computer drawn illustrations and not photographs but I had zero idea of how to get that (seriously, I started with NO knowledge of how to start. None.). I bought a 30 day trial of the Adobe CS4 package for 10.00 but it turns out 30 days is not nearly enough time to get a feel for everything it can do. In fact it took more than 30 days just for me to stop banging my head on my desk once I finally sucked it up and forked out the 450.00 the whole package (gulp). Then I had to figure out the different capabilities of Photoshop versus Illustrator since at first they seem the same but they're not (it turns out once you've made something in Photoshop, you can't simple dump it into Illustrator and tweak it). And then I found out, after hours and hours of work, that you have to draw things a different way if you want to fill them with color or pattern. And I'm not even going to get started on InDesign and what it does (because I'm only now figuring it out). Anyway, I wanted to share some of the progress I'm making. I get quite a few questions about producing my patterns on paper and I want to let folks know I'm really working on it (and why it's been taking so long). The first picture below is from one of my pdf skirt patterns. It's not awful but it's certainly not awesome and awesome is what I'm after here. The second one is my hand drawing which took me forever since I'm not a very good artist (but I'm actually getting better). I scanned it into Illustrator and then traced over it thinking that was the end of it. Well when I attempted to add color to some areas I was once again banging my head on my desk. Not so simple (not even a little simple). Fortunately I picked the right person (yes, I realize I'm super blessed to have her as a friend) to whine to and she was over here within a few minutes showing me the ropes. I took notes as fast as I could keep up and when I was finally ready to re-visit the process (I needed a break just to un-frustrate) I came up with the last picture. Success! See how there are different dashed lines, shaded areas, text, and the illusion of gathers and pins? It took a lot of work to figure each of those out and, to tell you the truth, I haven't been this proud of myself or felt this accomplished in years. At first took me a couple of (frustrating) days to create a simple apron outline and now I can whip one out in under a minute. Look at my re-creation of my Evelyn Apron Skirt outfit. It was lots of fun to make because this time I knew I could do it before I started. So that's a small part of the whole process but I've been wanting to share it so you could see why it's been taking so long (sorry I promised these patterns sooner, I had no idea what I was up against). It looks like we'll be sending 4 patterns to the printer this month with a few more to follow (including this one that I get so many requests for) and I can honestly say I'm proud to put my name on these patterns.